Hello Windows Insiders, and greetings from the Windows Defender team! As all may have seen, starting with Windows 10 Insider Preview Build 10571 we added built in context menu (Right Click) scan for Windows Defender. Yes, that is right, it is back!!! The most missed Windows 8 feature has returned by popular demand to Windows 10 platform because users like you gave and upvoted feedback using the Feedback App. Add back the ‘Scan with Defender..’ command to right-click menu for files/folders in File Explorer. This option should never have been removed with the switch from MS Security Essentials to Defender in Windows 8. In this article we wanted to spend some time talking about the feature work we did to enable content menu scan options and how you can perform this scan. This feature allows you to specify which files and folder to scan. This is really helpful when you want to determine whether a particular file or folder is malicious or not, but not find and open the UI. This option has advantages over the custom scan exposed via Windows Defender UI. It lets you pick files in the parent folder without scanning subsequent folders. You can use this option to scan network or external devices manually, if needed. With the release of Windows 10 November Update, we have gotten positive feedback, and we thank you for it. We also want you to continue providing feedback via the Feedback App to help drive changes that are important to you. 1. This feature does honor Windows Defender exclusions which means it is not going to scan objects marked for exclusion. 2. For context menu option will only be available only when Windows Defender is enabled and it’s UI is not locked. Note: if you have 3rd party software which adds context menu scan for Windows Defender, then please uninstall them manually. This feature will not uninstall your 3rd party extensions. 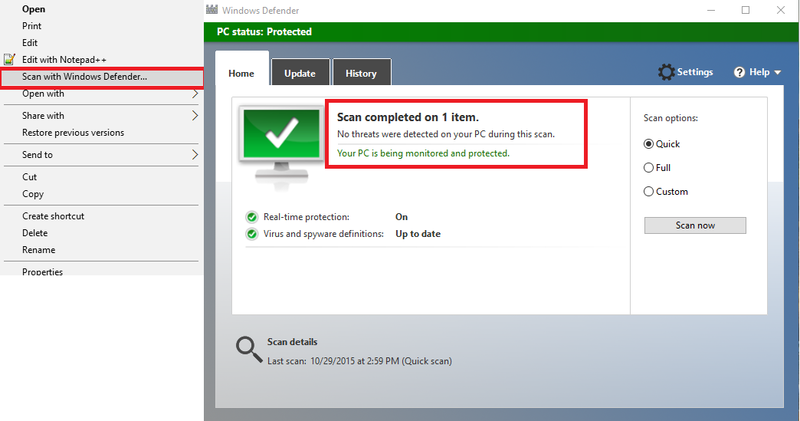 Having two context menu scans may cause unwanted behavior for Windows Defender scans. Same is expected for container files (like rar, zip etc .). This scan will do a deep scanning on container files. As we look toward upcoming release of Windows Defender, your feedback is very important to us. Your votes will help drive the important features to the top of our product planning. 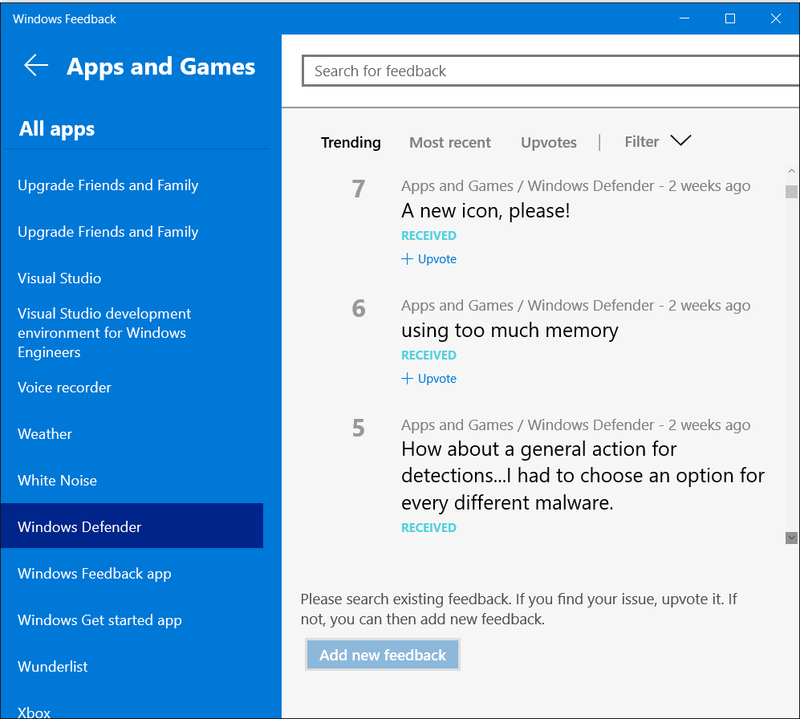 Thanks for helping us build Windows Defender, and keep that feedback coming! ‘Made by you’ articles highlight how we are addressing feedback from Windows Insiders, how we investigated this feedback to shape Windows, and why we have made these improvements. If you have feedback on this type of content or other aspects of the Windows Insider Program, please let us know via the Feedback App.